Another chapter in the history of Fairfield County history played out on Thursday at Waveny Park in New Canaan. 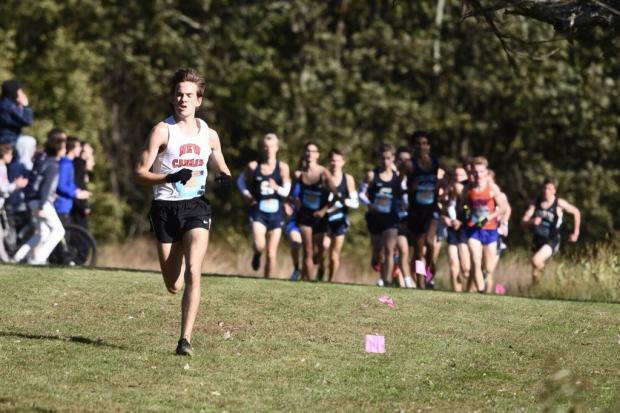 Senior Andrew Malling of New Canaan put in a solid summer of training to move up from 23rd in the FCIAC last year to claim his first championship. In doing so the senior became the 7th boy from New Canaan to win an FCIAC cross country title and the first since State Open champion Mike Cotton in 1976. Malling went out hard from the gun and and had a lead of about 100m by the first kilometer. While the pack gained on him, he maintained his lead and won in 15:47.96, which is one minute and 13 seconds faster than last year. "I don't have a great finishing kick so I came out of the starting chute fast." Malling told Gametimect.com. "The fact Waveny Park is New Canaan High's home course was a bit of an edge." While the course was slightly altered from last year due to the recent heavy rains, it was remeasured by Wilton coach Jim Gerwick, who has certified the US Olympic trials marathon course and made sure the course was still 5000m like previous years. Danbury coach Rob Murray said the course had "firmer footing and was probably a little faster than last year. Staples and Danbury have been battling out for FCIAC titles since the early 90s and Staples took home their 13th FCIAC title under legendary Coach Laddie Lawrence. The veteran coach, who is now in his 50th year of coaching missed the meet to be inducted into his college hall of fame. The Wreckers, who lost five of their top seven from last year's championship team used last year's strong junior varsity to claim their third straight title. Junior Morgan Fierro was 2nd in the JV race last year led the charge and took 4th place in 15:58. Within four seconds came the only two returners from last year's varsity squad- Nick Taubenheim and Mayo Ryan Smith who finished 4th and 5th place. Henry Haas, last year's JV champ, took 10th with 3rd place JV finisher Luke Lorenz finishing the scoring in 17th place. Staples scorers totaled 42 points, which was 25 points ahead of Danbury who was led by junior Jack Watson in 8th place. Meanwhile, the Danbury girls picked up the championship torch and came away with their first FCIAC cross country win in school history, squeezing by Trumbull 50-57. Both teams were extremely evenly matched with three Danbury and three Trumbull runners coming in 9th - 14th place, which was a span of less than three seconds. 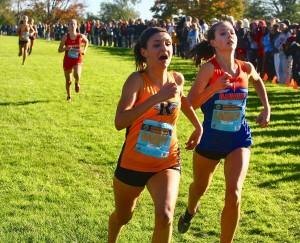 Danbury's Daniella Grullon-Pena surprised everyone by taking 11th in 15:14. The sophomore in her first season of cross country, was a sprinter on the track team last year with a very respectable personal record of 1:02 in the 400m. But in cross country she was usually the Hatters' 8th or 9th runner. The FCIAC allows teams to enter eight runners in the varsity race and Danbury girls coach Marsha Turek decided to enter Grullon-Pena to give her the experience. The young Hatter took advantage of the opportunity and finished about 2:45 faster than she did on two other 4000m course she ran this fall. You could argue the FCIAC course was faster than the other courses, but no one else in the field had improvements any where near as significant. In fact if Grullon-Pena wasn't entered in the line up, Trumbull would have won THEIR first FCIAC championship by a score of 54-56. This is just another example why we run the races and don't just determine who is the better team by the rankings. Third place team finisher Ridgefield, had an outstanding showing in their first non dual meet of the year. The Tigers, who are ranked 7th in the soundRUNNER Connecticut High School Coaches XC Poll were led by Gabriella Viggiano, who battled rival Lauren Moore down to the wire. 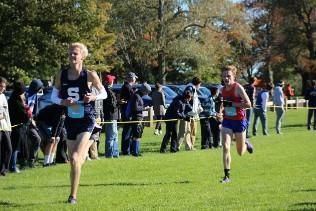 Viggiano just edged out the Danbury runner by .46 seconds to win in 14:39.97. The pair finished just about the same distance apart last year at FCIACs with Moore getting the nod for 2nd place and Viggiano taking 3rd. Next up for these teams and individuals will be the CIAC Class championships on October 27th at Wickham Park in Manchester, CT. Look for CT.Milesplit's preview of all the class meets next week.